The BRICS New Development Bank will address African continent’s infrastructure funding gap as the lack of infrastructure is preventing the development of intra-continental trade, South African Trade and Industry Rob Davies said on Monday during a radio interview on SAFM. “The lack of infrastructure is preventing our continent from moving up the value chain, so the New Development Bank can address the funding gap,” he said. He pointed out that the New Development Bank was not meant to displace the World Bank or International Monetary Fund, but rather to complement these multi-lateral development fund institutions. Davies said although the capital of the New Development Bank and the Contingency Reserve Arrangement had been set at $50 billion and $100 billion respectively, this did not mean that this capital would necessarily be held in US dollars. Meanwhile, South Africa is expanding its trade ties with its BRIC (Brazil, Russia, India, China) partners and bi-lateral trade jumped to 381 billion rand in 2013 from 297 billion rand in 2012, accounting for a fifth of total foreign trade in 2013, the detailed country trade data released by the South African Revenue Service (SARS) showed. South Africa exported 116.5 billion rand worth of goods to China in 2013 compared with 29 billion rand to India, 6.3 billion rand to Brazil and 3.9 billion to Russia. SA imported 154.5 billion rand from China, 51.9 billion rand from India, 15.5 billion rand from Brazil and 3.7 billion rand from Russia. This meant that South Africa had an overall deficit of 69.9 billion rand with the bloc in 2013 compared with a deficit of 49.2 billion rand in 2012. “We have a programme in place to promote value added exports to our BRICS partners through the work of the BRICS Contact Group for Economic and Trade Issues, so that we do not only export raw materials,” he said. 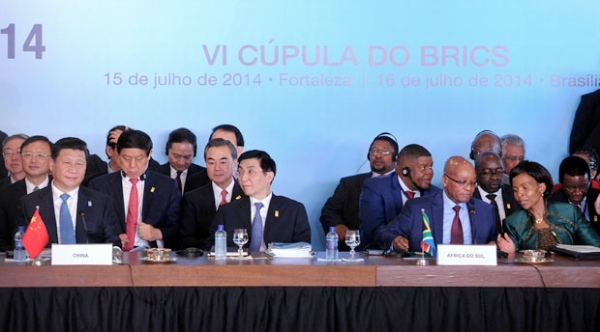 The 54 countries on the African continent can further industrialise and move up the value chain with the help from the BRICS (Brazil, Russia, India, China and South Africa), South African Trade and Industry Rob Davies said at the Sixth BRICS summit last week in Fortaleza, Brazil. The BRICS were also moving to denominating intra-BRICS trade in their respective currencies. “If you convert rand to US dollars and then to yuan there are costs involved, so if we convert rand directly into yuan that will reduce costs,” he said. Usage of the Chinese yuan as an international payments currency has soared by more than 400% since June 2011, according to the latest SWIFT currency tracker. In January 2012 it was only ranked 20th with a 0.25% share or almost half the rand’s 0.48% share at the time. Since then there has been a concerted effort to make the yuan an international payments currency and in December 2012, the yuan moved above the rand in the rankings as the yuan moved to 15th and the rand to 16th. In April 2014 it displaced the Swiss franc and was ranked seventh with a 1.43% share. The share of the rand remained stable at 0.42% between January 2013 and April 2014, while the share of the Russian rouble dropped by almost a third from 0.56% to 0.39%. In April 2014 the rand was ranked 16th, while the rouble was ranked 17th. Neither the Brazilian real or Indian rupee is ranked in the top twenty. What is the contact with the Board of Director of the New Development Bank. What are the conditions, technical assistance and construction equipment?